FA: Larry Derby, Mike Weis, Billy Westbay 3/75 FFA: Craig Luebben, Topher Donahue 11/2002? 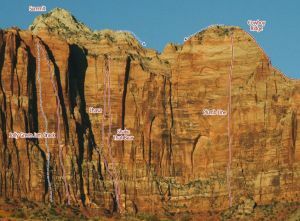 This is the first south face route. Follow the obvious top to bottom left-facing corner system that leads to the south summit. The crux is reportedly a 5.12b roof pitch on the lower portion of the route. Rack: unknown. Which SuperTopo guidebooks include a topo for Plumb Line?